So this is a bit of a look into my mind: I love watches. Unfortunately, many of the really awesome watches are outside of my price range. However, there are a choice few that are not only amazing, but affordable. My most recent acquisition? 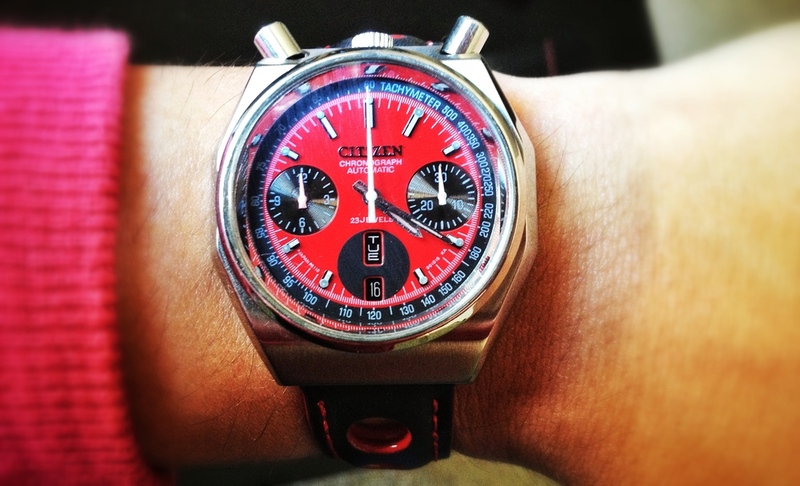 The 1976 Citizen Bullhead Automatic Chronograph. I purchased this watch from DC Vintage Watches, and it's exactly what I was expecting. If you're into watches, keep an eye on these guys. They have some pretty sweet stock of rare watches that are not only well-priced, but in great condition. I personally really love this watch because of the color, which many of you will probably find a bit ostentatious. It is very red, but I like red. With certain outfits, this is going to go great. The rally strap fits great with it. The guys at DC Vintage Watches matched the color of the dial with the strap extremely well. The term "bullhead" refers to the somewhat unorthodox placement of the crown and the pushes, above midnight instead of by three or nine o'clock. All in all, it's an impressive watch that's reasonably accurate, especially for a watch of this age. It only loses about 14 seconds a day, which isn't too shabby. It's also small, which is great since many watches these days are double the size of this watch (44mm across is getting absurd).